Lately more and more people in Homestead are choosing Miami Lakes Orthodontics, although dentist who offer Invisalign in Homestead are like baker’s dozens. This is because moms who want the best understand what board certified orthodontist Dr. Carmen Briceño Crespi has to offer. Everyone, for a long time, inevitably thought about a mouth full of wires and rubber bands when the word “orthodontics” was mentioned. Reasonably, these are all real preventions from patients going to the orthodontist’s office. Since the introductions of Invisalign, people are welcoming to the idea of this substitute to the traditional idea of orthodontics. We can discuss some pros of Invisalign Treatment in Homestead, Fl. Invisalign is a fairly comfortable, visually pleasing oral plastic device that helps to realign teeth that has been misaligned. You can be considered for Invisalign from the age of 12. American Association for Dental Research reported that Invisalign treatment are more expensive overall than conventional braces, but the patient needs less visits and the treatment period is shorter. Invisalign aligners are practically barely visible, so people don’t have to know that you are getting orthodontic care. Oral care is improved because you must remove the device before you eat and you must brush and floss carefully before replacing the aligners. Some patient even lose weight as they snack less during the process of orthodontic care. One last advantage to Invisalign, is that the inside of your cheeks and lips don’t get as sore as is known to happen with traditional orthodontic treatment. Do you know why patients from all over Miami-Dade and Broward keep coming to Dr. Carmen Briceño Crespi of Lakes Orthodontics for Invisalign Options in Homestead, Fl? The entire staff at Lakes-Ortho is highly qualified and their top goal is to make sure that you receive the best orthodontic treatment available, even if you don’t meet the criterion for Invisalign. Our office was newly remodeled and uses up to date technology, so you can be positive that you are getting quality care. The most important point that should be a part of your decision making process is that Dr. Carmen Briceño Crespi is a board certified orthodontist. Which means she took additional training in dentistry to be qualified by the American Board of Orthodontics for the title of “Orthodontics”. 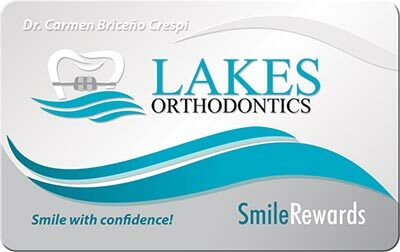 If you have more questions about Dr. Carmen Briceño Crespi of Lakes Orthodontics, check out our blog. Blog Post Related to Invisalign Treatment in Homestead, Fl. At Lakes Orthodontics we understand that dental insurance can often time be confusing which is why we have a highly trained professional staff that is dedicated to helping you understand your dental insurance benefits. We want to help you become aware of some of the basic concepts that will determine your insurance eligibility. What type of treatment are you looking to have: braces, Invisalign, etc. How long is your procedure (2 months, 6 months, 2 years, etc.)? What is the cause of the treatment (medically necessary due to pain, a traumatic injury, or something considered cosmetic)? Is your insurance a PPO or an HMO? Does it specifically state that your insurance has an orthodontic benefit? Is there an orthodontic benefit for the policyholder as well as dependents? Are there any age limits on your policy? Will the policy cover you if you are already in treatment? What if you already had orthodontic treatment before as a child? What happens if you change jobs/insurance in the middle of treatment? My point here is that dental insurance can be very complex, and you should always consult with your insurance professional in order to review your benefits and coverage. Lakes Orthodontics not only accepts most major dental PPO plans but our staff reviews your insurance plan with you at the initial consultation and makes sure that they explain your details and help you get the maximum benefit from your insurance carrier. Please contact us today to schedule a complimentary consultation and insurance review so that we can help you to Smile with Confidence!